With Zanussi you’ll find a cost-effective range of fridge freezers that deliver the space you need to store enough food for your household. A great selection of appliance sizes is available from Currys, from smaller models that suit less demanding food storage needs, to large fridge freezers with over 300 litres of usable space and additional features. Keep running costs low with A+ and A++ rated kitchen appliances which also minimise your effect on the environment. A frost free refrigerator will save time and remove stress from your life, while some models offer advanced air flow technology for improved food freshness and hygiene. Zanussi appliances include different combinations of storage and configuration features to keep things organised. Dual-usage shelves, adjustable humidity salad crispers and Super Fresh boxes are just some of the exciting extras available. Certain models provide easy-to-use external controls for temperature and special functions such as QuickChill. Door alarms alert you when refrigerator temperatures rise above safe levels. 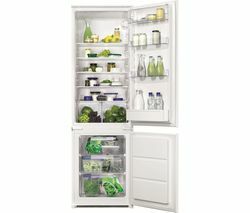 At Currys we are sure you’ll find the right appliance for your kitchen in our range of Zanussi fridge freezers.